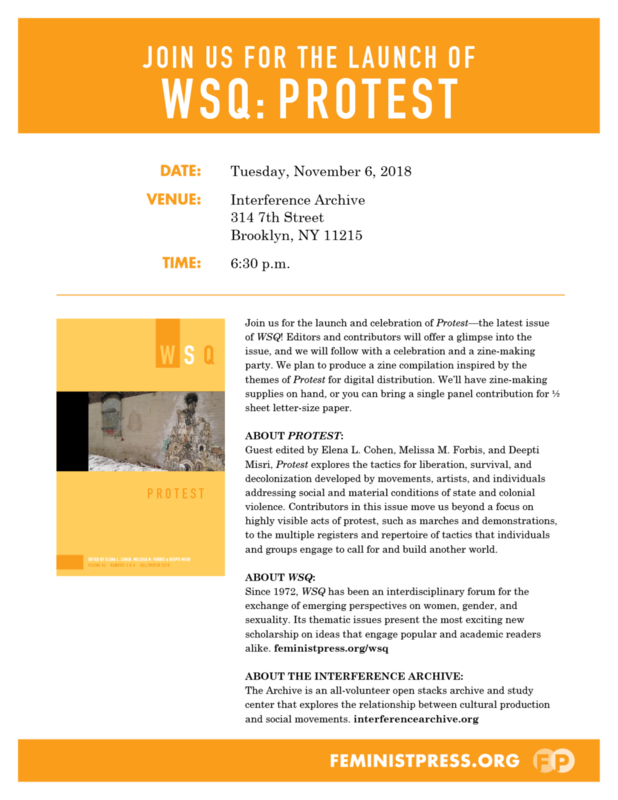 Join us for the launch and celebration of PROTEST—the latest issue of WSQ: Women’s Studies Quarterly! Editors and contributors will offer a brief glimpse into the issue, reading excerpts of our texts and sharing images of the artwork to generate a discussion of feminist protest that moves us beyond a focus on highly visible acts of protest, such as marches and demonstrations, to the multiple registers and repertoire of tactics that individuals and groups engage to call for and build another world. After, we’ll celebrate with food & drink and a zine-making party! We plan to produce a zine compilation inspired by the themes of Protest for digital distribution. If you’d like to join jus, we’ll have zine-making supplies on hand, or you can bring a single panel contribution for ½ sheet letter-size paper.